There are several smart TV’s on the market that have Alexa built in, but we’re here to teach you how you can connect almost any TV to Alexa for full Alexa voice control of your TV. 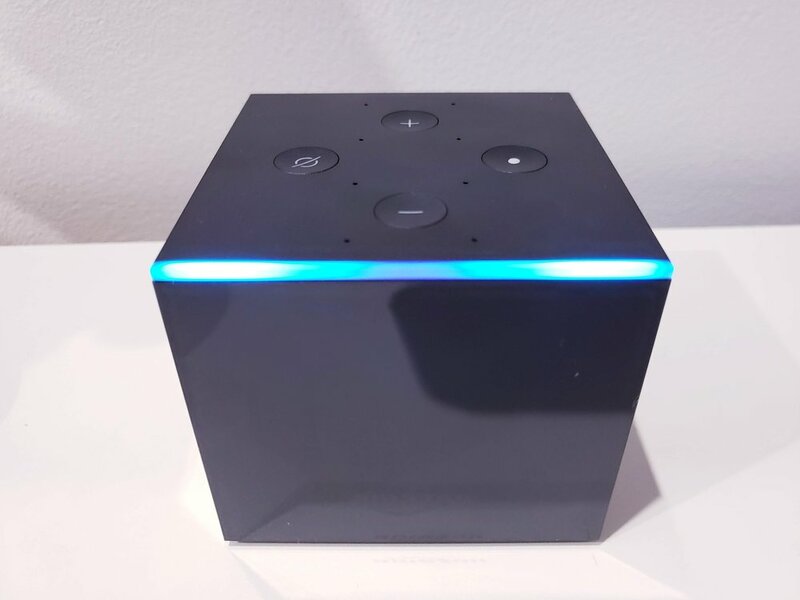 With Alexa voice control of your TV using the Fire TV Cube it will allow you to turn on and off your TV with your voice, adjust the volume, change channels, find your favorite movie & TV programs and will let you control your other smart home devices with your voice. Connect Alexa To TV: Fire TV Cube Connected To TV. HDMI cord was routed through wall to TV. Connect Alexa To TV : What Do You Need? If you want full voice control of your smart TV you can do it with the Alexa Fire TV Cube. 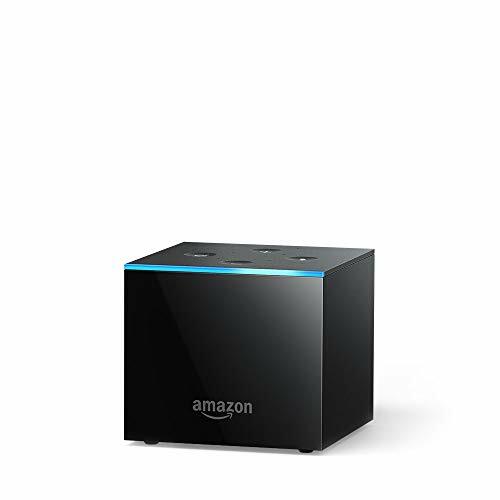 The Fire TV Cube has all of the functionally the Amazon Fire TV Sticks offer but also combine the powerful features of Alexa smart home and TV control in one box to offer you maximum functionality and future compatibility. With the Fire TV Cube it will provide voice control of your TV system and you will get access to hundreds of streaming services like Netflix Amazon Prime Video and Hulu. The Fire TV Cube is a great option for those looking to cut the cord because of the sheer volume of streaming services it offers. The Fire TV Cube also offers 4K resolution meaning that it will provide the highest quality picture output for any TV you choose to pair it with. Should You Get A Smart TV With Alexa Built In or Connect A Fire TV Cube? The best smart TV’s that work with Alexa we reviewed are all great. However not everyone wan’ts to make the step up to a TV with Alexa built in. You might want a different size TV, you might prefer a different brand TV, different style, or think that the picture quality of another TV better suits your viewing needs. Which is why the Fire TV Cube is a great solution for existing TV’s or any new TV that doesn’t have Alexa built in. The Fire TV Cube is ideal because it’s supported fully by the Amazon Alexa ecosystem and is designed to work with the largest variety of TV’s for maximum functionality and will continually get new over the air updates and features as time goes on keeping it up to-date with the latest technology. If you end up choosing a smart TV with Alexa built in, that’s great and you should be able to use many of the same smart voice features as the Fire TV Cube. With TV’s with Alexa built in it’s possible (but unlikely) that a particular TV manufacturer stops supporting updates on their ecosystem, with the Fire TV Cube you don’t need to worry about future manufacturer TV support because the Fire TV plugs in directly to the TV HDMI ports by passing the need for updates on your TV. Overall we think getting the Fire TV Cube offers the most flexibility and forward compatibility vs getting a TV with Alexa built in. Before I got the Fire TV Cube I had an Alexa Fire TV Stick for years and it continued to work great and get feature updates until I upgraded to the Fire TV Cube. I’ve had the Fire TV Cube for several months now and it’s worked flawlessly. I’ve come to expect the same great support and functionality updates with the Fire TV Cube that I experienced with the Fire TV Stick I used for years. Amazon delivers on their promises to make their products easy to use, customer friendly, and they continually get smarter and better with time. Connect Alexa To TV with Fire TV Cube. Connect Alexa To TV: What Can Fire Cube Do? The Fire TV cube is a versitile smart TV voice assistant and smart home assistant. It will allow you to control your TV with your voice, your smart home devices with voice and view streaming media right on your TV. You can enjoy thousands of streaming media channels in 4k and connect the Fire TV Cube to apps and websites like Facebook, Youtube, Reddit and even browse the internet with its built in Firefox browser. You can toggle between your cable TV and Fire TV and all of your streaming services by switching inputs. There are hundreds of smart voice commands that work with Alexa and you can read our related posts if you are looking to learn more about Alexa commands you can use with your new Fire TV Cube device. The Fire TV Cube has all of the combined features of an Amazon Echo Dot and a Fire TV Stick meaning that not only can you control your TV but you can also control other smart home devices in your home using your voice. If you have a compatible smart thermostat, smart doorbell, smart lights or smart plugs you can use the Fire TV Cube to control them with your voice. In the related posts section at the bottom of this post we have links to posts that will provide you with all the information you need to connect your other smart devices to Alexa or help you choose what smart home devices are right for your home. The Fire TV Cube is easy to install and the process of setting up the Fire TV Cube is painless, as you just follow the on screen questions and commands that show up on your TV once the Fire TV Cube is connected. The Fire TV Cube connects to your TV through your HDMI port. The Fire TV does not come with a HDMI cord so if you want to place it on your TV stand or where your cable box is located you will need to get a cord of the appropriate length. First connect the HDMI cord to the Fire TV Cube & TV. Plug in the included IR blaster to the back of the Fire TV Cube. Then plug in the Fire TV Cube. You will need to have you TV on and switched to the correct HDMI port to view the Fire TV Cube. The setup menu will appear on your TV screen and you just need to follow the onscreen prompts to set up your Fire TV Cube. Will A Fire TV Cube Work With My TV? If you have an HDMI connection and your TV is less than 7 years old the Fire TV cube will most likely work with your TV. Name brands like Samsung, LG, Sony and others work well with the Fire TV cube. We connected the Fire TV to several different TV’s to test it’s compatibility and it worked with the oldest TV we were able to find which was approximately a 6-7 year old Samsung Smart TV and it worked perfectly with our setup. We have an Xfinity cable box connected and the fire TV cube was able to interface with the cable box using the IR controller. Durring the setup there were dozens of different cable provider integrations to choose from to ensure a high range of compatibility with different cable providers and boxes. The great thing about getting a Fire TV Cube from Amazon is their no hassle 30 day return policy. But once you get your Fire TV Cube connected it’s doubtful that you would ever return this great piece of technology. What Smart Doorbells Work With Alexa? What Security Systems Work With Alexa?